Some recent opinions in the blogosphere notwithstanding, corporate worship is one of the most important ways in which we come to know and love God more fully. From its earliest days, the Christian faith involved both individual and corporate experience. In baptism we become part of something much larger than ourselves, the communion of saints, both living and dead, who love and serve the Holy Trinity. In Christian worship, we learn more about the faith, build up the faith of others, testify to our corporate identity, and join in the heavenly chorus of worshippers, such as we read of in the fourth chapter of Revelation. When folks say that corporate worship simply isn’t that important, with all due respect, I couldn’t disagree more. It’s particularly concerning, then, that some people among the community of faith find worship prohibitively difficult. For example, people with autism may find being in a crowd or certain kinds of music or singing to be quite stressful. Some children and adults, such as those with Down Syndrome, autism, or other disabilities that come to bear on intellectual development, may not be able to remain quiet during the parts of the service when it is appropriate to do so. My own son, Sean, who is seven years old and has Down Syndrome, will soon become the center of attention during any church service he attends. The people of our church are very loving and understanding with him, but Sean shouldn’t be the center of attention during worship. That isn’t the point of going to church. It makes it very difficult, then, to take him into a worship service. I know that faced with such difficulties, many parents of children with disabilities simply stop trying to go to church. I recently made the acquaintance of a remarkable young man named Zach Holler. 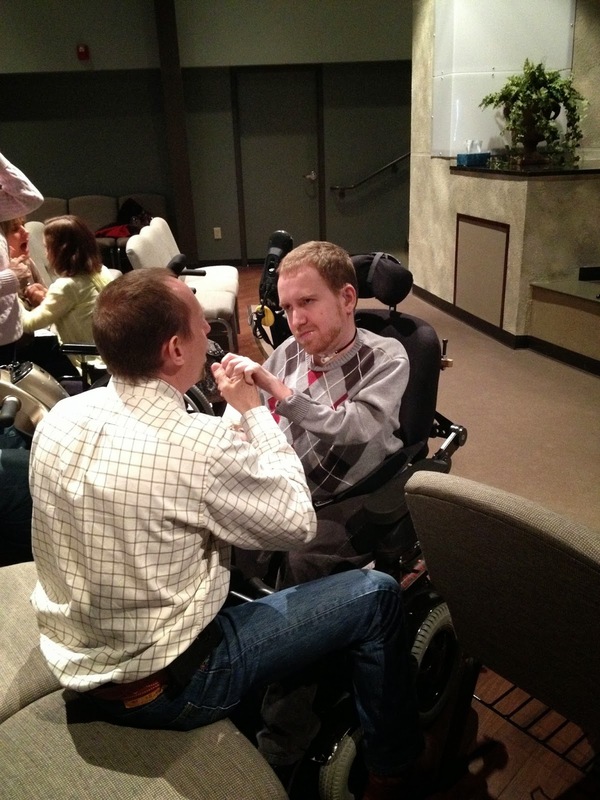 Zach attends Christian Life Center (CLC), an Assemblies of God congregation in Dayton, Ohio. He lives with multiple physical disabilities and uses interpreters to communicate with most people. He also feels a call to ministry, and his congregation and its leadership are supporting him in this call. Zach invited my family and me to attend Gentle Worship at CLC this week. 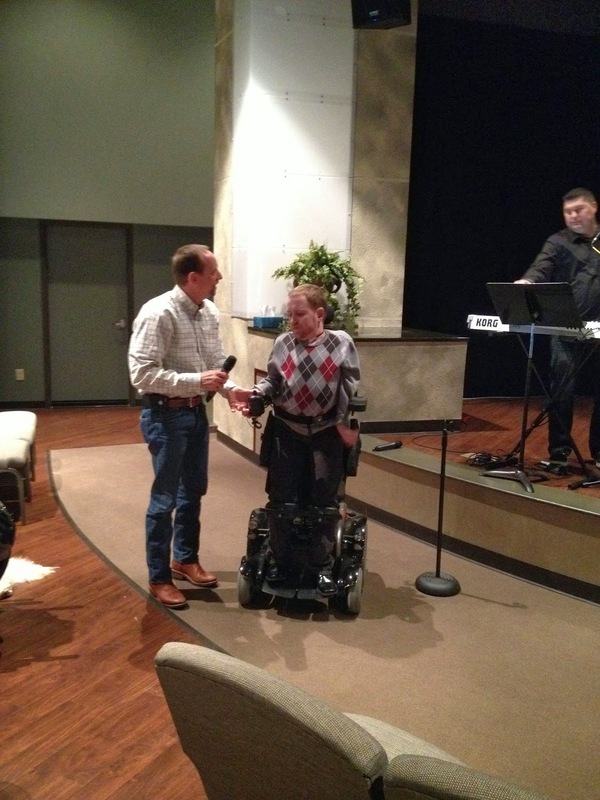 Gentle Worship is a service especially tailored for people with disabilities. I see it as especially helpful for people with cognitive disabilities, but it could be helpful for people across a wide spectrum of abilities. There is music, prayer, and a sermon, all in a very informal and relaxed environment where nothing is really considered disruptive. Sean was able to pay attention for a while, and then he began to get antsy. Towards the end, he was really starting to make his presence known, but it was not a problem. That is the point of the service. People of all abilities are welcome. 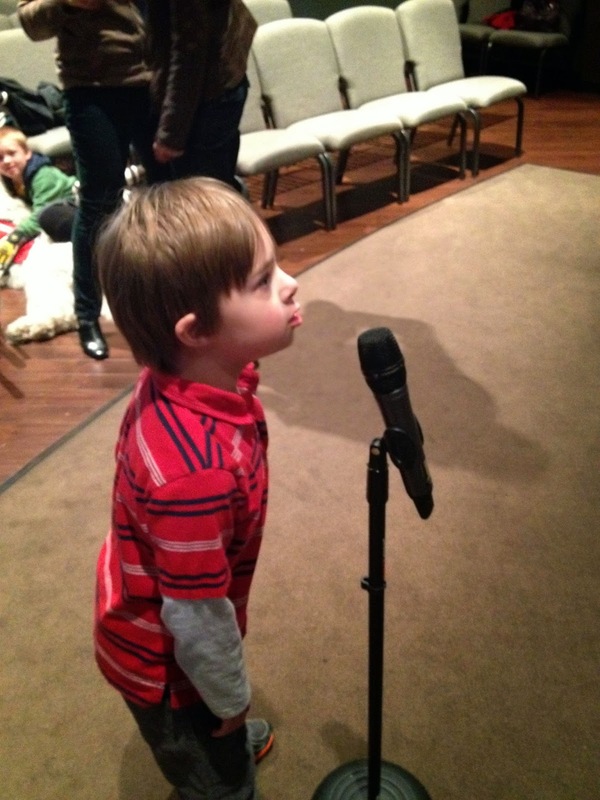 After the service was over, Sean ran up to the microphone and started delivering his own message! One of the highlights of the service was when Zach delivered the sermon. His father, Greg, served as an interpreter, and Zach blessed us with a rich and thoughtful lesson on the law, sin, and salvation. It was very clear to me that Zach is gifted for and called to ministry. Unfortunately, when people with disabilities do feel a call to ministry, they are often met with disbelief and resistance. It is a credit to the congregation of CLC and their lead pastor, Stan Tharp, that they have recognized Zach’s call and gifts, and are facilitating his leadership in the congregation. If you want to learn more about the role of the church in being in ministry with people with disabilities, I encourage you to come to United’s Light the Fire! Conference, which will be held at Ginghamsburg Church on May 8-9. It’s going to be a great event, and we have a first-class lineup of speakers and preachers. I hope you can make it! ← UMC.org: How About Some Evangelism? It is so exciting when a congregation supports those who are call of all abilities as well as seeks to serve those who struggle in a “regular” worship environment! GO CLC!